Grand Valley Gold & Silver address, phone, website, hours of operation, and more. 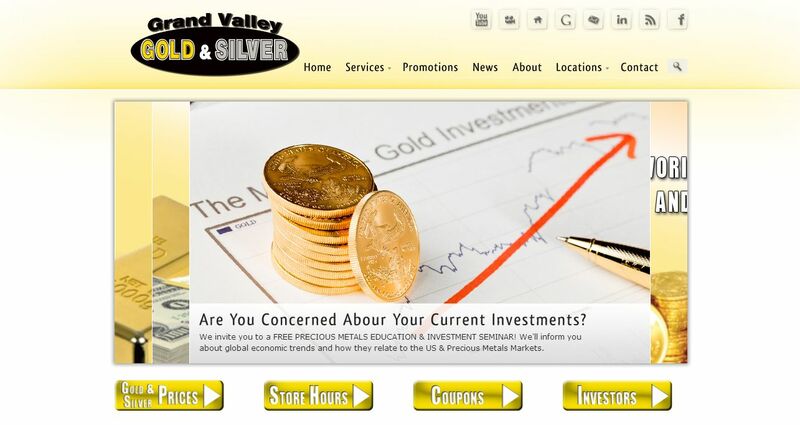 Gold, silver and other precious metals have hit record high values and show no signs of tapering off. People everywhere are cashing in, selling those old pieces of jewelry, sterling silver flatware, coins and gold bullion and walking away with more cash in hand than was ever previously thought possible. But in this crazy world of precious metal buying and selling, it seems that new gold and silver stores pop up every day. They all claim to pay the best prices and offer more than the other guys. They all claim superior service and better connections to precious metal wholesalers. So how do you know who to trust? We’ll just say it: you can trust us at Grand Valley Gold & Silver above all else. We founded GVGS on the basic principles of honesty, integrity and accountability. Its how we do business, day in and day out. You can be guaranteed that when you walk into our store, we’ll answer all of your questions as thouroughly as possible. We’ll take the time to explain how we’re testing the quality and purity of your precious metal items and show you how we arrived at the price we’re willing to pay for your goods. We won’t rush you or push you into a sale, because we know that if you leave with concerns you won’t be back and you won’t tell your friends about what a wonderful place we have. We also guarantee that if you find a better written offer, we’ll beat it– or give you a $10 GAS CARD for making the trip! That’s how much we care about your business, and how committed we are to being the best at what we do.